It is very essential to open learning classes and courses for European government officials and politicians to teach them the difference between the teachings and history of Mohamed versus the present Turkic so-called “Islam”. They must go back to school before they ruin Europe. 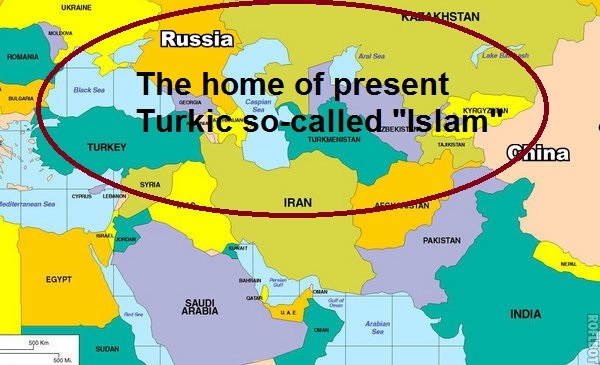 Turkic groups are invading Europe under fake and hostile own invention calling it “Islam”. Terrorism is Turkic Islam. Islam during prophet Mohamed b. (622-632 AD) was not beyond the main Arabian Peninsula. But during the first three Caliphs, Abu Bakr (632-634), and Umar (634-644)(Assassinated), Uthman (644-656)(Assassinated) it went into invasions. That was totally unacceptable to many believers but the Turkic elements encouraged such offensive military expansions. Turkic-Mongolians conquered Arabs and pretend to be Arabs since 1700 BC. The fourth Caliph Ali (656-661)(Assassinated) was the cousin of the prophet and he stopped that and carried out internal reforms and these were the main causes for the eruption of a brutal civil war throughout his rule (656-661) that ended up by assassinating him and killing most of this family. By those killings the original Islam died and it was replaced by a fake Turkic militant cult calling itself Islam. This became the source of terrorism, colonialism, and heresy. What is Islam and how it relates to Mohamed, Yeshua, Moses and all uncountable messengers? Original Christianity is a revival of the code of Abraham and Moses and these were sent to the Israelite only. While Islam has two different definitions; the correct one describes Islam as the single original religion existed even before creation. The common and existing wrong definition considers Islam as a new religion on its own and started with prophet Mohamed only. The teachings of Mohamed were supposed to put law/code for his people and region only; but also as a part of the only universal religion. The original teachings of prophet and messenger Mohamed were hijacked by Turkic Mongolians soon after his death, in the same way they hijacked those of Moses, Jesus (Yeshua), and others by Romans, Persians, Bedouins and Jews. So, the Turkic Islam of today is neither genuine Islam nor the teachings of Mohamed. To distinguish between the original and the present versions I personally call them “Mosesianity”, “Jesusianity”, and “Mohamedianity”. Turkic so-called religions are of Central Asian origin. True Islam distinguishes between prophets (revive existing law) and messengers (bring distinct law). Every messenger is a prophet, while not every prophet is a messenger. And it states clearly that God sent to each nation its own messenger and law. This leads to a conclusion that Mohamed was a prophet to the universe; and at the same time a messenger to the Arabs only. Islam describes all genuine messengers and prophets as Muslims, including Adam, Enoch, Abraham, all Israelite prophets, and even many unnamed foreign ones (Ghafir 40:78) and (An-Nisa 4:164). Therefore, true Islam is a single universal religion with a multitude of distinct national laws for each distinct nation. The national laws are mistakenly considered as distinct and conflicting religions. That is quite correct that the European leaders are sell-outs, and ethnic Europeans need to reject this unchecked immigration. No other countries on Earth are beaten into submissions and having to accept unlimited immigration – it is only the “White” countries. This is the communist plan to destroy Western Civilization. The greater enemy for the West is the communists globalists.